I came across the first round of truly beautiful looking figs the other day in one of my favorite markets on the Upper West Side. While for me the waning summer days are always a prelude to the beginning of class in the fall, these last warm months are also the grand finale of summer fruits. Blueberries, blackberries, figs and plums dominate the palette with their deep hues of purple and mauve. So when I saw these baskets of figs, I bought two. The first I ate out of hand, popping the tiny, edible seeds between my teeth. For the second basket, I wanted to make something that would highlight the figs, rather than force them into a supporting role next to, say, lamb or chicken. 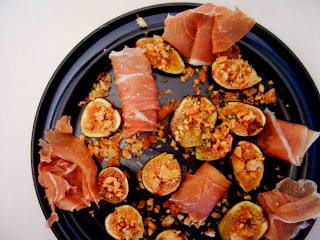 I settled on Judy Rodgers's Prosciutto with Warm Roasted Figs & Hazelnut Picada because 1) I already had some hazelnuts in the pantry and 2) it gives the figs primary billing. Rodgers acknowledges the Catalan origins of the picada. 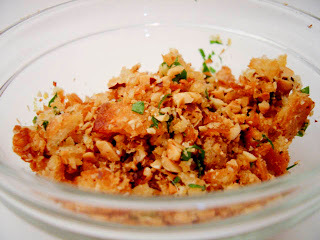 It is classically conceived of as a paste of nuts, breadcrumbs and herbs held together by oil. However, here, Rodgers thinks of the picada as a condiment, rather than as a thickening agent for stews and sauces, as it is used in Catalonia. By the way, how luck am I that I can get actual Prosciutto di Parma in my little local store, just a few blocks down? You know, the kind actually from Parma! 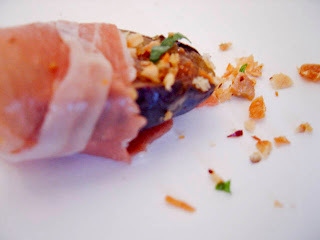 Coat the fig halves with olive oil and place on a cookie sheet, cut-side up. Broil until the figs are warmed all the way through and are starting to caramelize, about 3-5 minutes. 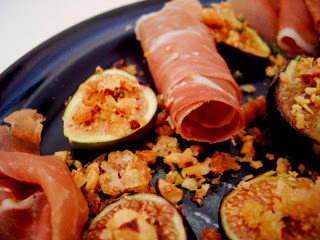 While still warm, sprinkle a bit of picada on each half and plate the figs among the slices of prosciutto. Serve. Pour the oil into a small skillet to a depth of 1/2 inch and set over medium-low heat. To test for the correct temperature, dip a piece of bread in the oil. If it sizzles slightly, reduce the heat a bit and add the bread in a single layer. I also noticed that the oil was ready at just about the same time as it was becoming fragrant. Fry each side of the bread for 2-3 minutes until the bread is a nice light caramel color. Remove the bread and cool on paper towels. paper bag and use a rolling pin to crush it into crumbs. Finely chop the rest of the ingredients and combine it all together. Taste, and add extra salt if necessary. Andrea, I am so glad that you patronize farmers' markets and your neighborhood grocery stores. I watched the Oprah show - home from work, waiting for a repairman - and Dr. Oz, author of "YOU Staying Young" was on. They did a survey of the audience. And the healtiest - the one who was aging the "BEST" was a women who exercies but also who only eats food she cooks herself! She inspired everyone who listened. Good luck with your blog and keep inspiring us! Thanks for sharing your recipe and your tips as well, great help for me as a newbie in the kitchen, just starting ang enjoying cooking. Want to know more about me and this blog? Check out my About page.